The layering of jelly is something that needs to be practiced. Especially if you're aiming to become pro enough to one day attempt the below concoction. In the meantime, I can offer some tips and tricks, and what not to do when working with packet jelly to create jello shots or cocktail jelly. Having nowhere near the amount of patience required for creating a shot with SEVEN layers, I suggest you opt for what you are most comfortable with (or have the time for). So just because I stuck with three analogous colours (green, blue and purple) doesn't mean you have to! Try to consider the overall effect e.g. 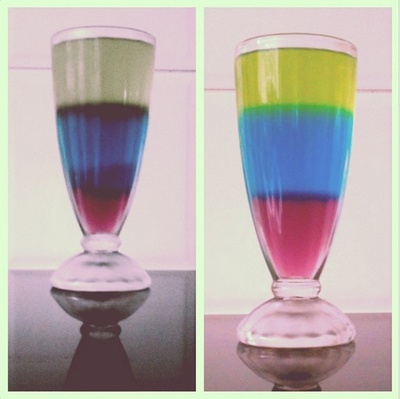 a trippy combination, or whether you want the colours to be indicators of the contents, e.g. green for lime etc. The world of jelly is one best explored! 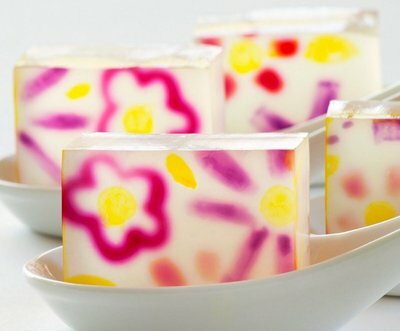 You'll want to save the recipe for Elderflower Mojito Cocktail Gel. Otherwise don't forget that other elements can be added to jelly - but be careful to do your research first. Standard jelly packets recommend against including fresh pineapple, kiwi fruit or paw paw as they won't allow the jelly to set. 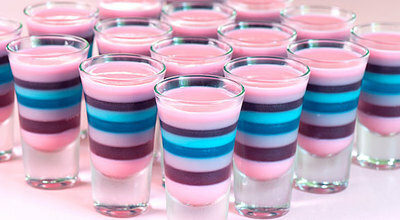 The Rainbow Jelly Shooter is sure to be a popular request! Don't forget to consider what glass or bowl your finished product should be served in! 1) Follow packet instructions to the point where you end up with a bowl of jelly mixture for your first layer (you won't be able to save some of this mixture for another layer as the gelatin will set). 2) If you are inserting anything 'heavy', this is probably the safest layer to do so, therefore place the object before you pour this layer over the item. Otherwise, simply pour your first layer however you'd like to. 3) Place into the fridge to set! If you'd like stripes on an angle, place something under the glass which will allow it to rest easily in the fridge. 4) For a crisp line, it is important that each layer is allowed to cool and set properly - see exhibit a's fail on the left in the blue layer versus exhibit b's improvement on the right below. For my quantity of jelly (500mL), four hours is the minimum set time - hence it is important to plan your jelly creations well in advance! 5) Create another batch of liquid jelly for your second layer, however it is crucial that you allow this liquid jelly mixture to reach room temperature before coming into contact with your perfectly set first layer which is at fridge temperature. 6) Gently and slowly pour the mixture (there's no rushing perfection) above your first layer. I find it useful to hold the glass on an angle so as to reduce the impact the pour has on the surface tension of the previous layer. That way the liquid jelly almost drips into place and avoids breaking through layers. 7) Allow to set, and repeat steps 5 - 7 to your heart's content. 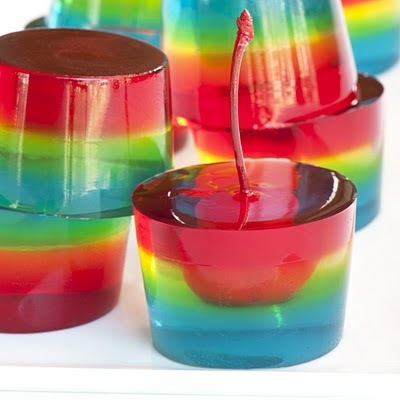 8) Serve up your jello creations! Best outdoor movie experience in Sydney?